So I do love to keep my buds ever in the loop about my hair choices haha but I am at a standstill you guys. I know I want to cut my hair shorter but I can't decide on the style. I have been eyeballing lots of different do's over the past few months and crushing on one more than the other, depending on the day.... so you know what? I am going to poll you guys and whichever one is the favorite overall is the one I am going to go with. For real! So you know, I am going to go to a very light blond so these choices are based on cut only.... though Tilda's color is what I am going for in general. Katy Perry's assymetrical, razored bob. Tilda Swinton has a rockabilly feel with shaved sides and lots of length on top. See what I am saying? So hard to choose! So here is what I want to do. I want you all to vote on which one is your favorite and the week of the 22nd I am going to make an appt to get the haircut chosen by my friends, family and readers, no questions asked. Obvi, I will do before and after pictures so I can show you all how it turned out aaaaaaand really, you guys are helping me make a tough decision that I can't make for myself... so which one is your fave? Which Haircut should I get? Aaaaaaaaaaannd as an added bonus, just by voting you are entered to win a Conair Supreme Triple Curling Iron pack as well as some of my other favorite hair care products! Obvi, there are additional ways to enter too but my biggest concern is make sure you comment on the post to let me know which number is your favorite! Make sure to vote in the poll (so I can keep track) and then enter the giveaway via Rafflecopter if your interested in the haircare goodies! Giveaway open internationally until July 16th, 2013. I love number 3, but i think you would get bored with it. If i had the guts, I'd totally choose Ginnifer Goodwin's piecey pixie cut, so I choose #6. I think #3 would be the best and fun to style. I voted for 4. I personally like 3 best, but as Kelby said below - I think you'd get bored. Ginnifer at 6 is a close second : ) You have been talking about a pixie for ages! I voted for 4- you'd look amazing(er)! I really like the lengthy bob! The pixie is so cute but the bob would be more versatile (and isn't as much of a pain when/if you want to grow out!). Can't wait to see what you choose! I seriously almost went with #6 when I was at the salon last week... it's still tempting me. #5 =) I'm sure whichever one you pick will look great! i love #5! i think it would look fabulous on you. #6. But I also like #3 and #4. I picked #1 and I'm sad I'm in the minority! #5 then transition into #4! I chose #5. They'd all look great on you, though! I chose #3 It is super cute and I think it would look fantastic on you! I chose 3. I have always wanted that haircut. I choose number 2, yeah! 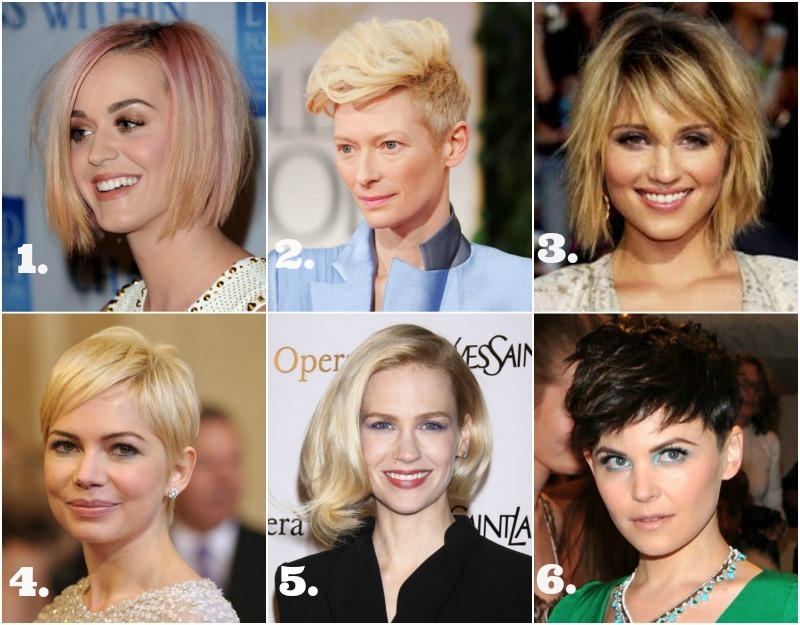 I chose #1 but I am not super fond of the short short hair cuts. yes! my favorite [#6] is gaining support! that was my vote! i guess #3 although I really don't like any of them. #3 cause it seems like you're the type that would like a little fun and movement in your hair style!